It's kind of hard to review food products, because what you get is my personal taste. But still, there are some things that can be described, right? 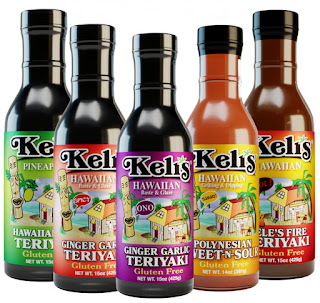 I got a selection of sauces from a company called Keli's that makes Hawaiian-style sauces. 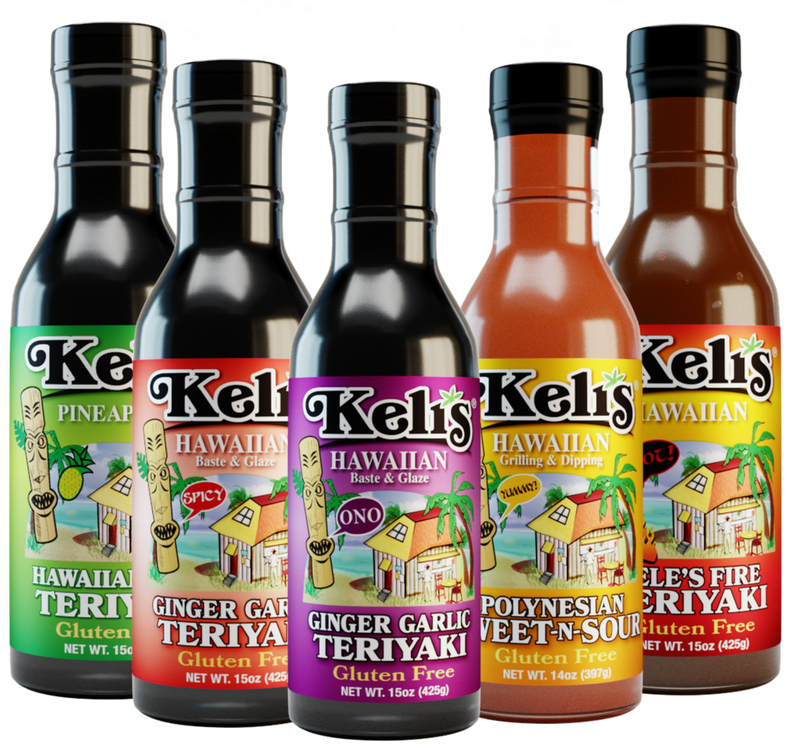 Since I've never been to Hawaii, I can't tell you whether these sauces really are typical in Hawaii, but I am a big fan of teriyaki sauce. Sometimes I even make my own, although I don't do it very often. Now that I've tried Keli's , I'm perfectly happy to not have to make it at all. I haven't tried all of the products yet, since I don't have room in the fridge for a bazillion bottles of sauces that I would use in the same way. But so far, I'm pretty happy with what I've tried. the sauces aren't too sweet or too salty or too ... anything. They're well balanced and flavorful. My first attempt was some sous vide chicken breasts. Basically, I put some of the sauce in the sous vide bag before cooking. And then I served it with a little extra sauce on top. Good stuff. So far I haven't tried all of the sauces I received (and I didn't get every single one, but I got enough to keep me happy for a while) so I can't really say which is best. But if you like teriyaki, I think these are worth giving a try. FYI, these come in smaller bottles as well as big jugs, in cake you're really a fan of teriyaki. Who's it for: Peeps who like teriyaki. Cons: Might be hard to find at your grocer. But you can buy it from the company's website or Amazon . Wishes: Ummmm. Can't think of anything at the moment. So ... there are a bazillion types of sugar these days. Besides the crystallized white and brown sugars, there are the wet ones, like honey and agave. Coconut sugar seems to be getting more popular. Recently, I got a chance to sample some date nectar (another wet sugar) from a company called D'Vash. 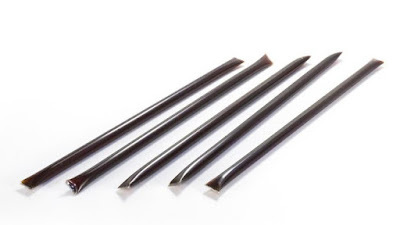 They sent little plastic tubes of the date nectar. Perfect for taking along for sugaring drinks at work or on the go. Or for sticking in the cabinet for pre-measured sugar. They also sell it in a bottle. I tried it several times in tea. While I don't usually sweeten tea, there are some occasions where I like the little extra sweetness. The verdict is that the D'Vash Date Nectar has good flavor, but not strong flavor. It didn't overpower the tea, but it added just a little bit or richness without really changing the flavor of the tea. If you're trying to avoid the crystallized sugars, this one's a nice choice. Who's it for: People who want to be sweeter. Pros: Tastes good. Not weird. Cons: It's a little spendy. Wishes: This would be nice if it came in a much larger container to lower the per-serving price so it would be reasonable for baking. Another month, another box of interesting goodies from Degustabox. They send me a box every month so I can tell you all about it. This one was pretty interesting. I've saved the most ... unusual ... for last. This is basically a hot sauce made from Bird's Eye chilis, along with spices. I've tried Nando's before, so I didn't open this bottle, but I'm sure it will be in the hot sauce rotation soon. This stuff is awesome. Since it's in a squeeze tube, you can use a little bit, then just put the cap on and put it in the refrigerator. It's great in soup, stews, rice, or even to boost the tomato flavor in pasta sauces that are a little weak. Pretty much anywhere you might use a little bit of tomato paste. A must buy. I always have some of this on hand. Easy-to-make green tea with peach flavor. This is sweetened with stevia, so it's zero calorie. Personally, I thought it had a bit of astringency that's common in green teas, so I added just a tiny bit of sugar. Oopsie. I guess that ruined the no-calorie aspect, but I liked the flavor better when it was very lightly sweetened. I use this sort of thing for baking - you know, when a recipe calls for strong black coffee? Or sometimes I add just a little bit into chocolate desserts. It's great to have on hand, even if you don't drink espresso, and it's great when you need that really strong cup of coffee, but don't have an expresso machine. An anti-oxidant drink that has all the goodness of green tea, but no caffeine, in a convenient can. I haven't popped this one open yet, but it sounds like a good idea. An energy shot with coffee and cocoa. I didn't get to sample this one, but energy shots certainly are popular. Here's an interesting idea. You melt the candy bits right in the pouch, then snip the corner and drizzle onto fruit, baked goods, or whatever you like. This is a genius idea. Great for people who don't want a lot of fuss. Chewy caramels. Can I say more? I didn't buy any Easter candy, so this is a nice treat. This particular brand doesn't use any artificial flavors or colors, and not high fructose corn syrup. Munching on one of these while sipping coffee or hot tea is particularly nice. Gluten-free, carbs, vitamins, and stuff to boost performance. I almost wish I worked outside the house so it would make sense to take these sorts of bars with me for road food. I've handed this off to someone who will make more use of it. Here's something different. Steel cut oats that are quick-cooking. I'm not fond of rolled oats or quick cooking rolled oats or instant rolled oats. I don't like the texture. But I totally love steel cut oats. So I was really curious about this product. Could I really have steel-cut oats in a few minutes rather than having to plan ahead to have them cooking in the rice cooker on a timer for morning ... or without waiting a long time for them to cook? The answer is ... this stuff is decent. The only quibble I have is a personal one. I'm not a huge fan of sweet foods for breakfast, and the sample I got was a maple and brown sugar version. I think I would have liked the plain version better. But ... because I'm weird, I do like this sweet one as a dessert or snack with a little pat of butter. Genius. I love hummus and I make it at home quite often, but this makes it so much easier. Hummus ingredients aren't difficult, but tahini can be a little hard to find and it's somewhat perishable, so if you don't use a lot of it, it might be one of those things you throw out before you use up. Lemons are relatively cheap and easy, but some folks don't have lemons sitting around all the time. I gave this a try - just put the chickpeas and the Hummus Made Easy in the blender and let it do its job. Pretty tasty. I thought it was just a tad salty when I first tasted it, but pita chips usually aren't salty, so when I ate it with the chips, it was fine. This hummus "kit" is a great compromise between home made hummus and store-bought, pre-made hummus, but it's got one advantage over both. It's shelf stable. So you can have hummus pretty much any time you can summon the effort to push the button on your food processor or blender. I've tried the Wild Planet tuna and it was high quality and really good. I haven't opened this can yet, but I think it will be a great product to have on hand when I want something with chicken but I don't have a cooked chicken lurking about. Like chicken and noodles. Or chicken fried rice. Or chicken salad. Or chicken soup. I'll tuck this in the cabinet for later use. Last, and weirdest. These are chips made with cricket flour. Yup, you heard it right. Cricket flour. I stared at these bags for a long time. Waffled over whether I was brave enough. Crickets are high in protein ... I know that. But ... but ... but ... in the end I decided that it would be better to pass these along to someone else. I'm sure they're tasty. Crunch, crunch, chirp, chirp. I get these boxes from Degustabox at no cost so I can describe them to you. Just before I left for the Housewares Show, the folk at The Grommet sent me a really cool rolling pin to use. I set it aside to use for baking some cookies. The pin has little flowers cut into the pin so when you roll out cookies (or other baked goods that would keep their shape during baking) the flower shapes are raised up from the base of the dough. So anyway, I got home from the show, whipped up a batch of cookies from a cookbook, and used the Valek Large Embossed Rolling Pin to press the pattern into the cookies. It all went swimmingly well. The little flowers were visible as a pattern on top of the cookies, and they remained after the cookies were baked. I thought about dusting the cookies with some powdered sugar to make the flowers even more prominent. And then when I started taking the cookies off the baking sheet, they broke. I waited until they were cool, and the situation didn't improve. The cookies fell apart like they were make out of wet sand. Blergh. NONE of this is the fault of the rolling pin. Either the recipe was flawed, or I did something stupid when I made the recipe. I'm going to say it was me. It took me a while to get back into my groove after the trip, so it's pretty likely I measured something wrong. But anyway, thanks to the cookie disaster, you aren't going to see finished photos of cookies. Nope, no cookies for you! I'll use the pin again, I'm sure. And you'll see the results over on my recipe blog. But for now, no cookies, just the pin. I have a few unusual ideas for this, too. We'll see how it goes. Who's it for: People who want fancy cookies. Pros: Works well. Really easy to use. Solidly made. Packaged nicely in a tube. Cons: Once you have one pattern, you'll probably want more. Source: I received this from The Grommet for the purpose of a review. There must be a million ways to make coffee. And sometimes it feels like I've tried them all. But then something new comes along that's at least a little bit different. In this case, the new thing is the Dripo Japanese-style iced coffee maker . Among the many styles of coffee makers, this is the style that slowly drips cold water onto coffee grounds to make a smooth, less-acidic cold coffee. 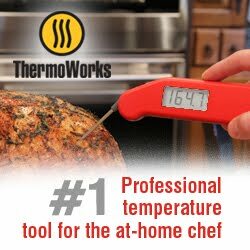 This one suggests not only using cold water, but using ice. In order to get the grounds thoroughly wet, there's a small round piece of coffee filter paper than you can put on top of the grounds. Or, you can wet the grounds first, before you start the dripping. If you don't do either of these, the water tends to run around the grounds rather than wetting them completely and extracting all the flavor. I've used this to make both iced coffee and to make a concentrated cold brew to add to hot water to make hot coffee. My very first effort, the coffee was a little too weak, so I added more grounds for my next batch. Inexplicably, the water took a crazy long time to drip. Then I checked the directions again, and you can control the speed of the drip by tightening or loosening the container. Problem solved. Now, I know what I'm doing, and I'm happy with the coffee I'm making. And ... I had a brainstorm. I can assemble this thing and put it in the fridge and let it work its magic in there overnight. I'm mostly using this to make the more concentrated coffee that I combine with hot water. 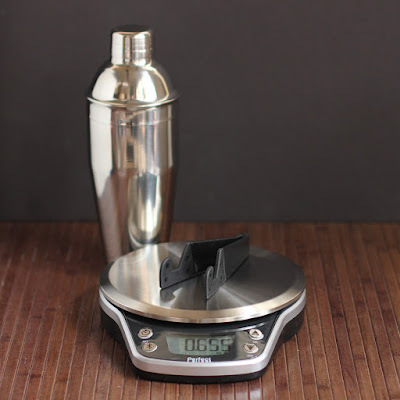 I have a larger cold brewer, but this one is handy for making flavored or specialty coffees. Because although that hazelnut coffee I bought a while back is tasty, I don't really need it every single day. This would be great for making coffee while traveling, too, since it wouldn't take more space in your luggage than a regular travel mug or water bottle. In the hotel room, all you'd need is cold tap water to make your coffee. How easy is that? Overall, this works well. It also comes in a fun box that is shaped like a milk carton, so it would be fun to wrap as a gift. Who's it for: Coffee drinkers. Cons: If you drink a LOT of coffee, you might want a brewer that makes more coffee. Wishes: Can't think of anything at the moment.